When I applied for a 3 year position with the “Mining Automation group” at CSIRO QCAT (Queensland centre for advanced technology) in November of 1999 they were in urgent need of someone to design PCB and create wiring diagrams for an urgent project. 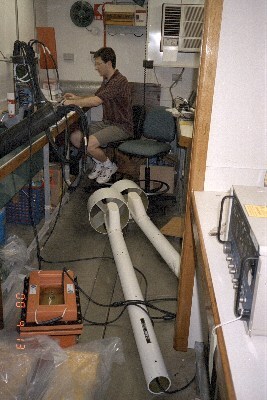 The project was to make a package for doing geo-physical recording at a depth of 2000 meters in the Bismarck Sea. There was a trip planned the following April which was mainly hunting for "extremophile" microbes with our stuff hitching a ride. 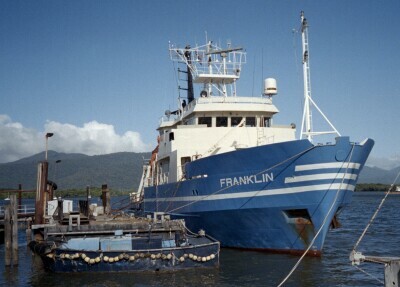 The ship used for the trip was the CSIRO research vessel R.V Franklin. After an informal cooks tour of QCAT I left QUT and was employed as casual and then later given the three year contract I was originally after. With four months left to drop our bundle into the Bismarck things were busy. The overall design was no where near finalized. The original wish list was whittled down to reality. At one point a power budget showed it would not work. One PC (of two) was removed from the design, sample rates reduced and other compromises made. I looked after the overall wiring diagrams, made interconnection boards and also worked on a electronics for a towed electrode array, will allow induced polarisation (IP), resistivity and impedance measurements. Two of us drove the gear from Brisbane to Cairns and I helped debug the system on the ship. Five of us from QCAT were there but only two were going on the trip – I get sea-sick so I was happy to be left behind. In a nut-shell we had two pressure vessels. One was for power supplies of which there were plenty and the other housed a PC104 stack, the towed array drivers and some stuff I probably shouldn't talk about. We didn't get the chirp sonar till a few days before the gear left QCAT (a surprise – it was much bigger and heavier than we imagined). We didn't see the magnetometers until on the ship a few days before the ship sailed. Right - Jonno is debugging the software on board the ship a day or two before she sails. The PC104 tube is in front on him. 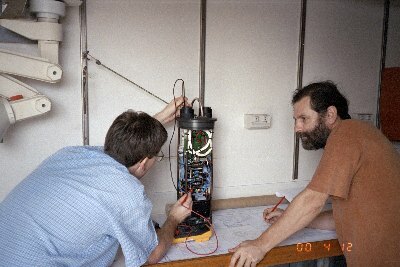 The power supply tube is at 45 degs sitting in the sink, the white tubes on the floor are magnetometers and the orange thing is a deep-sea battery. Left – Yours truly helping Jonno check the wiring after we did a rebuild to replace a faulty data acquisition board on the night before departure. The chirp idea was intriguing so I later wrote a chirp program for the PC. After the undersea stuff it was back to normal in the automation group this means coal. I was put to work on the mk3 (improved mk2) Highwall mining project. Highwall mining for those who don't know is one of many mining methods for digging up coal. When coal is near the surface it is usually mined using an “open-cut” method. This is abandoned when the seam is covered with too much dirt. What is left to a highwall with a seam at the bottom. Some underground mining method can then be used but it setup cost is high. An alternative is to dig out more of the seam with a remotely operated machine. As no people go underground no roof support is used. This is generally not a problem unless the tunnel come too close together or cross. To guide the miner (machine) accurately the mk3 uses high accuracy military grade inertial sensors (aka INS or HORTA). My job was to shoehorn two pc104 boards into a panel-PC by making an adapter. This worked. I also made an interface for the odometer which measured the distance the mining had traveled. The INS uses an SDLC interface, four wires were used to send INS commands and data from the control cabin to the INS in the miner. I was working on a control system to turn the INS on and off remotely when I stated that it would be easier to build a protocol converter than do it the way we were. People had spent years trying to do just that and failed. I was told I could look into it – about a week later I demonstrated I could speak SDLC to a INS (aka HORTA talk). I used a AVR2313, no SDLC controller chip, all signals were software generated. This generated deeply thoughtful looks. A few days later the original MK3 work I was doing was shelved and my protocol convert became the nerves of the MK3. Note that I did not write the PC GUI. I wrote PC diagnostic software but not the end-user interface. The original system used 4 wire for comms another one or two for power switching. Each wire goes through a slip ring so fewer wires is very good. The original system had comms to the INS but nothing else. My system used 2 wire RS485 for everything. It worked at 115 K Baud - three times the speed of the MK2. It was tested through a 1000 meter cable with safety barriers fitted. These interfaces usually need to be I.S. (intrinsically safe) for explosive atmospheres, this means current and voltage clamps. I wrapped the INS packets in my own protocol so we could talk to the protocol converter as well as INS. It took another eight months to fully develop the system. It did everything originally planned plus remote battery monitoring and some autonomous power management by the converter. After commercialization I continued to upgrade the MK3 hardware/firmware. Dual gamma counters and dual inclinometers were added. There then were a bunch of small jobs I won't go into in any detail. Mainly these were either for the “rapid roadway development” project or the “landmark” longwall mining automation project. The RRDs autonomous conveying-bolting module (ACBM) incorporates several ranging lasers scanners (made by SICK). When running in continuous scan mode (>30 scans/sec) serial data streams out at 500Kbaud minimum. This is non-standard data rate, for setup purposes we also need 9600. This is pain for PCs but not for micro-controllers. I made a serial to ethernet (10BaseT) converter based on the crystal LAN etherent controller CS8900a and a AVR8515. It took a while to find all the bugs but eventually it was solid. I was also part of the Numbat team but it was never used in anger, I took it for a walk a few times.